Are you looking for the best Title Loan Software and Payday Loan Software? Alpha Omega Consulting Group, Inc. has been in business for over 35 years, making us one of the oldest computer software companies in the United States. We specialize in loan software with advanced features, reliability, performance and support. We are industry leaders in the following areas: Auto Title Loan software (also known as Title Pawn software); Payday Loan software (also known as Cash Advance software); Check Cashing software; Installment Loan software for Amortized Loans, Rule of 78s, Balloon Notes, Signature Loans and Hybrid methods; Line of Credit software; Consumer Loan software; Lease software and Money Order software ... all in one convenient, user-friendly program that can be run as a web-based application on a Cloud Server, on an Apple Mac using Remote Desktop, or as a true Windows application on your local computers and network. You can rent our software as a web-based application on our Cloud Server for as little as $195 per month, or buy the program and run it on your own computers for as little as $995, depending on your state(s), number of users and the features and support you need. Our prices vary by state, so please call for an exact price. We also support highly profitable methods of generating higher revenues and profits, such as Title Loan Protection from Lloyd's of London (also known as Debt Obligation Waivers or Debt Cancellation Waivers), CSO, CAB, Mechanical Breakdown Service Agreements, Auto Clubs (also known as Car Clubs and Road Clubs), Identity Theft Protection, TILT loans, Flex loans, etc. And our program is customizable, which means it can be adapted to your business. We began developing software in 1980, so we were designing, programming, customizing and supporting software decades before our competitors existed. Most importantly, we support what we sell and don't force our customers to rely on web-bots or automated voice mail "help" systems. Our support comes from programmers who know our software inside and out. Also, if you have questions about the industry, such as how to do car club and CSO/CAB title loans and payday loans in Texas, motor vehicle equity line of credit (MVELOC) loans in Kansas, "blended interest rate" title loans in Virginia, "debt obligation waiver" title loans in Florida, or "line of credit" payday loans in states where traditional payday loans are illegal, our knowledgeable staff will give you free, friendly advice with no obligation, even if you don't buy our software. We can help you save many hours on fruitless quests for hard-to-find information, and we never pester or badger potential clients, because we know their time is valuable. If you need information about the laws of specific states, please scroll down this page to the state section, or just call the toll-free number below. Please call us toll free for a free live demo, or to discuss your needs. Or use the E-mail Contact Form at the bottom of this page. generated automatically by our software. 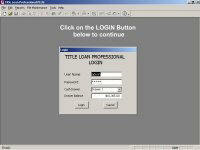 To see our interactive Title Loan Professional slideshow, please click the picture at the left. If you don't have a high speed Internet connection and the demo is too slow, please click here. For info on particular features, please click the links below. The good news is that you can rent the Cadillac of the title loan and payday loan programs for as little as $195 per month, or buy our software and run it on your own computers for as little as $995, depending on your state(s), number of users and the support and features you need. Please call us toll-free at 1-866-802-5742 ext. 101 for an exact quote customized to your company's state and needs. Advanced features we offer include Automatic Texting of Collection Messages, Electronic Signatures, Website Automation, Teletrack Interface, Black Book Interface, Kelly Blue Book Interface, Edmunds Vehicle Valuation Interface, Photo Management, Loan Consolidations, Line of Credit, authorize.net, Advantage ACH and other ACH interfaces, Quickbooks/Peachtree Interface, and much more. We will be glad to explain how our title loan business software can help your company make money. We believe we have the best title loan software on the market, by far, because this is what we specialize in, along with payday loans and other related transactions. We also offer online title loan software solutions, through integration of our application with websites. We have web programmers who can help create a web-based title loan solution for you, or "connect" your website to our title loan servicing software on a client/server basis. We also offer free title loan software in the form of our demos, so that you can test the software before you commit to buying it. Credit Service Organization (CSO/CAB) Title Loans, Payday Loans, and other Loans. These types of loans are increasingly popular and have been ruled legal by a superior court federal judge in the landmark Lovick vs. Ritemoney case. That ruling opened up the CSO/CAB title loan and CSO/CAB payday loan industries in Texas, creating potential gold mines for Texas lenders. Other states like Ohio, Maryland and Florida seem to offer similar opportunities. Such loans may be legal in every state, if the interest rates offered are low and fees are charged for legitimate services like helping clients obtain loans, pay their bills, and/or repair their credit. If you want more information about CSO and similar loans, please contact us for free information, via phone or email. Personal Line of Credit, Equity Line of Credit and Revolving Line of Credit Loans. These type of loans allow lenders to swim in the same loosely-regulated waters as the big banks, home equity lenders and credit card companies. In every state that we've entered with these types of loans so far, small lenders are allowed to do such loans without special licenses (the line of credit goes back to the prairie settlement days, when storeowners gave farmers lines of credit until their crops came in). The big lenders make oodles of cash by offering lines of credit to individuals, then earning a variety of fees and interest, including late fees, cash advance fees, annual fees, etc. What is the effective APR on a $100 balance, when the borrower pays a $20 to $30 late fee? The secret to making money in states with interest rate caps is to keep the balances low in proportion to the fees charged. We have the software and the expertise to help you earn money the way the "big boys" do. Internet. For companies interested in doing title loans, cash advances and payday loans via the Internet, we have custom features and contracts for both title loans and payday loans. We also have the ability to print contracts to PDF files which can be emailed to clients or posted to websites. We also have an interface to an electronic signature vendor. This means lenders can do Internet title loans and other loans without paying outrageous software to get started. With our software, you can set up a basic website and test the waters for around $1,995 to $2,995 and then add more advanced features to your website once it becomes profitable. If your company is interested in web-based software for Internet title loans or Internet payday loans, please contact Mike Burch toll free at 866-802-5742 ext.101. Companies interested in doing title loans via a website will be interested to know that one of the first companies to do Internet-based title loans all over the United States has been using our software since 2004, with good success. Canada. For Canada, we support title loans, payday loans, check cashing and "buy down" notes in which the interest is added to the principal as a lump sum, and the loan is then paid off without further interest accruals. We have done custom programming for Canadian lenders, and our 800 number is toll free in Canada, so please call Mike Burch at 866-802-5742 ext. 101 for more information. Mexican and Hispanic. We have a number of Spanish contracts and are more than willing to work with companies that make loans to Hispanic clients. For Alabama, we have added a unique Keyword Report that allows users to quickly and easily generate those pesky Loan Denial Reports and Litigation Logs required by the state of Alabama. We have a state-specific letter that allows delinquent clients to pay off their loans in four payments, as the state of Alabama requires. We also have both plain paper and Burrell title loan and payday loan contracts pre-programmed into our software, so you can be up and running in a flash. For Arkansas we have custom contracts for internet research and other products that work similar to title loan and payday loan contracts. These contracts allow Arkansas companies to sell services while giving cash as a rebate and collecting a larger amount on a specific date. For Arizona we have a variety of title loan, payday loan and installment loan options and custom contracts. Our clients in Arizona are increasingly converting to multi-pay installment loans, and our software offers a number of options for multi-pay installment loans, such as amortized loans and balloon notes. We have plain paper contracts customized for Arizona. Since the payday loan regulations changed in Arizona in 2010, it seems to be completely legal to do a consumer installment loan with an ACH agreement that is more convenient than a payday loan for borrowers, and still highly profitable for lenders. The key is to keep the duration of the loan short, the balance low, and suddenly small fees turn into large profits. If you have questions about this, please contact us via phone or email for a free consultation. For California we have English and Spanish cash advance/payday loan contracts that can include ACH and Arbitration agreements as part of the contract. We also have a wide variety of custom title loan contracts for California. Title loans in California are generally done on an amortized loan basis, and if your company charges an up-front filing fee (such as an origination fee, documentation fee, etc.) that is retained in full or in part by your company, it is imperative that the software you select includes this fee in the Federal Truth in Lending boxes, increasing the APR and Finance Charge disclosures. Our software can handle what we call "Regulation Z fees" (full disclosure is mandated by Federal Regulation Z). But software originally written for pawn shops, check cashers, payday loan companies, etc., may not handle such fees correctly, meaning that unsuspecting title loan companies may be subject to federal class action lawsuits by predatory law firms. There is a very simple way to make sure that your software is compliant, so please call Mike Burch toll free at 866-802-5742 ext. 101 to make sure that your company is in compliance with Federal Regulation Z. Even if your company doesn't charge such a fee currently, do you really want to use a program that doesn't "understand" and comply with critical federal regulations? A few minutes to test for full compliance is a good idea, whether you already have software or are considering a new program. For Delaware we have custom features and contracts for both title loans and payday loans. We also have the ability to print contracts to PDF files which can be emailed to clients or posted to a website. This means Delaware-based companies can also do Internet-based title loans. If your company is interested in Internet title loan software, please contact Mike Burch toll free at 866-802-5742 ext 101. One of the first companies to do Internet-based title loans all over the United States has been using our software since 2004, with good success, and is able to do title loans in all but a handful of states where repossession and/or electronic signature regulations don't favor title loan companies. For Florida title lenders, we have custom features and contracts that are similar in concept to the Texas CSO/CAB model that was ruled as being legal by a Federal judge in the landmark Lovick versus Ritemoney case, with an interest rate at or below the state usury level, and a substantial fee agreed upon by the lender and borrower. For Georgia we have programmed our software to automatically reduce the title loan interest rate to 12.50% after three months on title loans, per state regulations, and we also have the ability to interface to Georgia police departments to report title loan/title pawn transactions, as is required in certain areas. We have a variety of custom program features and title loan contracts for Georgia. Many prospective title lenders in Georgia find it hard to determine how to get a business license from the state. The solution is surprisingly simple and easy, so please contact Mike Burch toll free at 866-802-5742 ext. 101 to get "the inside scoop." For Idaho we have custom contracts and custom features for the state that allow lenders to make high-interest-rate loans "right out of the box." For Illinois we have a variety of custom loan products and contracts that include a consumer loan with multiple postdated checks, a balloon note, installment title loan contracts, wage assignments, ACH and Arbitration agreements, and much more! Since the payday loan regulations changed in Illinois, making payday loans less attractive, installment loans have become "the way to go" and we have a number of custom features and contracts for Illinois lenders in our software. For Iowa we have Motor Vehicle Equity Line of Credit (MVELOC) contracts and billing statements that work very much like a credit card or home equity loan billing system. We have spent many hours working with Iowa lenders to develop custom program features and contracts for Iowa. For Kansas we have Motor Vehicle Equity Line of Credit (MVELOC) contracts and billing statements that work very much like a credit card or home equity loan billing system. For Kentucky we have custom payday loan contracts, and being based in Nashville, Tennessee, we are "just down the road" and are willing and able to work with Kentucky lenders. Louisiana title lenders should contact Mike Burch toll free at 866-802-5742 ext. 101 to get "the inside scoop" on doing title loans in Louisiana. We have a variety of custom payday loan and title loan contracts for Louisiana. For payday lenders, it is important to understand that Louisiana has the "pickiest" and most complicated payday regulations in the United States, and therefore while it's easy to make money, it's important to have software that can handle the details legally and correctly. Payday software that works fine in other states may not function legally in Louisiana. For instance, late interest on payday loans must drop to 36% APR after 30 days, and then to 18% APR after 12 months. Our software has been heavily customized for Louisiana payday loans and title loans. We have had clients use our software in Maine, but it would be best to contact Mike Burch toll free at 866-802-5742 ext. 101 to discuss the details. Maryland companies may be interested in the Virginia market, which is dynamic and booming. We are in discussions with companies in Maryland that believe title loans may be legal there, but at the moment we do not have lenders doing business in Maryland. If you have input or questions about Maryland, please contact Mike Burch toll free at 866-802-5742 ext. 101 to get "the inside scoop." For Mississippi we have a 10 payment title loan with a 10% principal reduction, per state regulations. In addition to the 10-pay title loan contract, we also have a Mississippi cash advance/payday loan contract. For Missouri, our software can do title loans on either a renewal basis with daily periodic interest, or on an installment loan (amortized or balloon) basis. These options are available for other states as well, but in Missouri you may want to offer both types of loans, on a loan-to-loan basis, and with our software you can. Missouri Department of Finance auditors have referred Missouri lenders to us, which is a very good sign! We also have a variety of contracts for Missouri balloon loans, 45-day consumer loans, and much more. For Montana, we have worked with a number of lenders to meet the latest state regulations, and we have custom contracts for Montana. We can refer Montana lenders to other lenders in the state, so that they can work together to achieve full compliance with the latest state regulations. Please be aware that title loan software that has not been customized for the latest regulations may not handle the state-mandated principal reductions correctly, since they "kick in" in the middle of the loan. Please contact Mike Burch toll free at 866-802-5742 ext. 101 to get "the inside scoop." We have loan offices using our software in New Hampshire, but it would be best to contact Mike Burch toll free at 866-802-5742 ext. 101 to discuss the details, as the industry is still relatively "young" there. For New Mexico, we have custom program features and contracts. As with Arizona, we see New Mexico lenders moving toward installment loan methods, such as amortized loans and balloon notes. If your company charges up-front fees such as filing fees, documentation fees, or other loan origination fees, it is vitally important that you understand and comply with Federal Regulation Z, so please contact Mike Burch toll free at 866-802-5742 ext. 101 to get "the inside scoop." For Nevada we have a number of loan products and contracts, including a payday loan contracts, installment loan balloon notes, and title loan contracts. For Ohio we have custom payday loan contracts and have done custom programming to split the charge to the client into interest and fee components, per Ohio state requirements. For Oklahoma we have a custom cash advance/payday loan contract that allows a flat fee to be added to a loan for the Veritec database research fee. We also have a title loan contract for Oklahoma title lenders. For Oregon we have a variety of loan products and contracts, including cash advance/payday loans, title loans, installment title loans, and installment consumer loans. We have done a lot of custom programming to meet the various Oregon state regulations. Since the latest Oregon regulations went into effect, the "dark cloud" is that it's harder to make money in Oregon. But the "silver lining" from what we've heard is that many lenders have closed their doors, and it is possible to operate profitably by making smaller loans and scooping up the "cream of the crop" among local borrowers. Please contact Mike Burch toll free at 866-802-5742 ext. 101 to get "the inside scoop." For Rhode Island we have a custom payday loan contract. For South Carolina, we have done custom programming to make our software be able to do loan increases (also known as "refinances" or "flip loans"). We also support true daily interest on installment (amortized) loans, as SC auditors are now recommending or requiring (with some degree of inconsistency). We also have Spanish title loan and payday loans contracts for SC. For South Dakota we have custom title loan programming and contracts. Please contact Mike Burch toll free at 866-802-5742 ext. 101 to get "the inside scoop." Tennessee is our home state, as we've been based in Nashville for over 30 years. If you're based in Tennessee, we've got some home cookin' for ya'll. Our software generates state-required reports such as the Schedule C, the Title Pledge Log, and the Repo Log. We support title loans, payday loans, check cashing and money order tracking in an "all-in-one" package specifically designed for Tennessee lenders. For Texas we support CSO/CAB title loans and payday loans. For Texas lenders who want to avoid OCCC oversight and fees, we also support title loans done on a "car club" or "auto club" basis, with an interest rate below 10% to avoid Texas usury laws and OCCC oversight. We also have custom contracts for internet research and other products that work similar to title loan and payday loan contracts. However we see no reason to do "oddball" loans in Texas any longer, with CSO loans having been ruled legal by a federal judge, and with the Texas Secretary of State, Attorney General and OCCC all being in agreement that CSO/CAB loans are legal in Texas as long as the lender and CSO companies are properly incorporated and related to each other. We can refer Texas lenders to Texas attorneys if they need help incorporating to do title loans and/or payday loans in Texas. Please call Mike Burch toll-free at 866-802-5742 ext. 101 for more information about Texas title loans, payday loans and the legalities thereof. We can also refer you to company that will guarantee Texas payday loans, ensuring your company a profit on every transaction and eliminating the need for you to handle collections, if you give us a call. For Utah, we have recently updated our title loan and payday loan contracts for the latest Utah regulations. Utah seems to make more changes to its regulations (and "interpretations" thereof) than any other state, so it's important to select a software vendor committed to the state. We are. Please contact Mike Burch toll free at 866-802-5742 ext. 101 to get "the inside scoop." For Virginia we have updated our software to calculate title loans using a "blended interest rate" that is unique to Virginia. We also support the Motor Vehicle Equity Line of Credit (MVELOC) contract and billing statement system, which works like a credit card or home equity loan billing system. Also, with the new Virginia payday regulations putting a damper on payday loan renewals, we have added a new feature that allows revolving line of credit (RLOC) loans to be done as "bridge" or replacement loans for traditional Virginia payday loan borrowers. These RLOC loans are actually more profitable than payday loans, and there is no interest rate cap. Better yet, no special state license is required. Lenders who are interested in picking up the "cream of the crop" among traditional payday lenders in Virginia should contact Mike Burch at 866-802-5742 ext. 101 to discuss how RLOC loans can be done in Virginia, in lieu of traditional payday loans, or as supplemental or "bridge" loans when a payday borrower is unable to renew a traditional payday loan. The good news is that there is a simple, easy, highly profitable alternative with Alpha Omega's software. The bad news is that, as of the time this text was added, none of our software competitors seems to "have a clue." So Virginia lenders may believe the sky has fallen because their software vendors have their heads stuck in the sand! Again, please call Mike Burch if you want information about Virginia loan method that's so simple, easy and profitable it will "knock your socks off." We have had clients use our software in Washington, but please contact Mike Burch toll free at 866-802-5742 ext. 101 to discuss doing title loans and payday loans in Washington. For Wisconsin we have the custom contracts and software features lenders need to make high-interest-rate loans with a few minutes of installing and configuring our software. We have had clients use our software in Wyoming, and we have custom title loan and payday loan contracts for the state. Please contact Mike Burch toll free at 866-802-5742 ext. 101 to discuss doing title loans and payday loans in Wyoming. For just about every state on the list above, we've either heavily customized or tweaked our software to some degree. And please keep in mind that the regulations in your state can change any day. The software that works today is only as good as the software company that supports it tomorrow! And support has "been our claim to fame" for over 35 years.